While most people don’t appreciate being seen as irrational, it can affect others much more. Some people become deeply frustrated by the mere thought of others calling them irrational, and so they strive to be someone who cannot be viewed this way. 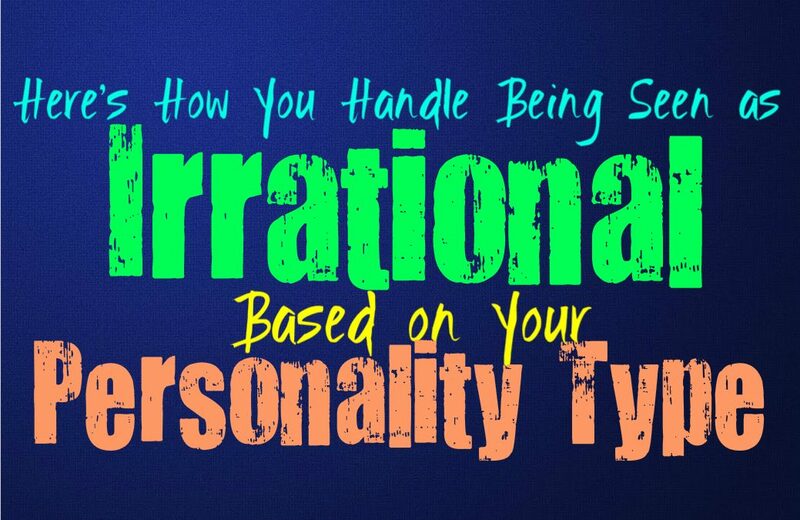 Here is how you handle being seen as irrational, based on your personality type. INFJs really don’t appreciate being seen as irrational, especially since they are both emotional and logical people at the same time. The fact that INFJ do care about the emotions of others and have a deep sense of compassion, can leave them open to being considered simply emotional people and that is not the truth. INFJs also have a deep sense of logic and they use their intuitive abilities to approach things from a more factual point of view. They are highly aware of the truth, and they don’t need to simply focus on emotions in order to process things. They don’t like being viewed as irrational and can become rather annoyed with people who look at them this way, mostly because it is not true. ENFJs definitely don’t appreciate being called irrational, since they are people who value logic and reason. While they do find themselves more focused on compassion towards the emotions of others, that doesn’t mean they are irrational people. They often look at the facts and weigh the situation along with how their response will affect others. While ENFJs ultimately focus on taking care of those around them, they still do this in a very capable and rational manner. They don’t like when people consider them to be emotional or irrational, and can become very bothered by this. While INFPs do focus on their emotions that doesn’t mean they are irrational or scattered people. They can become frustrated by people seeing them as one-dimensional and become a bit frustrated if they are called irrational. INFPs do follow their hearts but that is simply because their morals are deeply important to them. They don’t want people to consider them irrational simply because they have strong inner beliefs and they believe in following what feels right to them. ENFPs don’t often pay much attention to what most people say about them, especially as they become more comfortable with themselves. Once the ENFP accepts who they are and figures themselves out, they don’t like focusing on negative people and their false opinions. They definitely don’t appreciate being viewed as irrational, but at the same time they don’t care if strangers underestimate them. ENFPs do focus on their emotions a lot, and enjoy being able to follow their heart whatever it might take them. ENFPs would take being called heartless or boring as much worse insults than being a bit irrational. INTJs definitely don’t like being called irrational and can actually become very frustrated by this. While they try to avoid caring much about what others say, this is something that goes against who they are as a person. INTJs are rational people, and they value this part of themselves deeply. They strive to approach everything from a logical and level-headed point of view, even where it might be difficult for others to do so. They aren’t irrational people and they certainly don’t appreciate people who would inaccurately view them this way. For the ENTJ being considered irrational would certainly be one of the biggest insulting statements. They aren’t irrational people and they strive to be quite the opposite in all of their actions. They don’t focus on emotions because they often believe they can’t be trusted, and would much rather focus on facts and straightforward logic. People viewing them as irrational and illogical is entirely untrue and extremely frustrating for the ENTJ. This type of insult often feels slanderous and goes against who they are and what they believe in. INTPs definitely don’t like being viewed as irrational and can become deeply annoyed by this. INTPs focus more on logic and reason, and so being considered irrational can be frustrating. While this is something that displeases them, there are times when their imagination and intuition can lead them down different paths than what is expected. They do focus on facts, but INTPs also think outside of the box which can leave others completely confused by them and how their minds work. This can lead to them being seen as irrational, but that is mostly because those people don’t understand and this can be rather annoying for the INTP. ENTPs try not to care much about what others think of them, except for their loved ones. If someone does consider them to be irrational it is often because they lack a sense of understanding towards the ENTP. ENTPs have rather open-minds and sometimes their thought process can go down a rather intriguing rabbit hole where others just cannot seem to follow. This can cause them to seem irrational even though they are actually the opposite. ISTJs definitely don’t appreciate being viewed as irrational, since they represent the opposite of this. ISTJs are more interested in focusing on reason and logic rather than looking into things emotionally. They process things in a logical and factual manner, and don’t feel comfortable approaching things with their emotions. Because of this they strive to be as efficient as possible and become truly frustrated if people would consider them to be irrational. ESTJs are certainly not irrational people and so being considered as such would be deeply frustrating for them. They can become bothered by what others think of them because they want to be considered a valued member of their community. While ESTJs are thick-skinned they still don’t like having others treat them like they are irrational. They are focused and logical people who try hard to do things in an efficient manner. ISFJs definitely don’t like being seen as irrational, especially since it can occur from time to time. ISFJs focus on the emotions of others and are sensitive and compassionate people. This sense of warmth and understanding can cause foolish people to view them the wrong way. While ISFJ do care about taking care of their loved ones, they are still very reasonable people who strive to be driven and focused. When people see them as irrational it is because they don’t understand them, and this can be upsetting for the ISFJ. ESFJs definitely become hurt and frustrated if someone sees them as irrational. They are focused on the emotions of others and do their best to take care of their loved ones. ESFJs might be focused on the emotions of others but they are also very practical people. They also have a very rational side to their personality and so being considered irrational is something that bothers them. They especially want their loved ones to view them as both rational and compassionate, since this is often how they view themselves. ISTPs try not to focus much on how others see them, except for the few people they care deeply for. ISTPs try to deal with their own business and don’t want to become bothered too much by how others view them. This often helps them process things themselves without having to constantly feel insecure about their own actions. ISTPs want to be free to make their own choices and they are well aware that they aren’t irrational people. ESTPs definitely don’t like being seen as irrational, especially by their loved ones. They are logical people who try to focus on being rational and getting things done the right way. While they do look at the facts ESTPs also have an emotional side to their personality, and most of the time they try to keep this to themselves. When someone close to them calls the ESTP irrational it can be truly shattering for them, and even leave them feeling angered by the situation. ISFPs focus on their heart and their inner morals, which can lead to people calling them irrational sometimes. While this might bother them a bit they try not to let it drag them down. ISFPs would rather be around people who appreciate them for who they are, even when they have irrational moments. They simply prefer to follow their hearts and they trust their inner emotions as a sturdy guide through life. While this can make them seem a bit chaotic, they try not to let the opinions of others make them feel held back. ESFPs don’t mind being seen as irrational sometimes, but it does upset them when they are trying to convey a point. When the ESFP is being playful and a bit foolish then they are perfectly find with people seeing them as a bit irrational. When they are having a serious conversation or even an argument, being called irrational is one of the most frustrating and insulting things for them. ESFPs follow their hearts through life and would rather live in the moment than get hung up on things that might drag them down.